The concerts @ the Supper Club in Nov 1993 are considered by “most” fans to be “The Real MTV unplugged”. 4 fantastic shows in 2 days, all of them delivered at approximately 60 min. The early show performance [of “Ring Them Bells – Supper Club 17 Nov]…. may well be the single finest moment of the Never Ending Tour.. Here are some audio & a video. A mixture of old classics, songs he hadn’t played for a while and tracks from World Gone Wrong were all treated to the true authentic voice of Bob Dylan. Not only that but each show seemed better than the previous one and some songs, such as, “Queen Jane” & “Ring Them Bells” , were performed nearly as well as they have ever been, either before or since. Thanks, Egil, for posting these tracks. Opinions obviously vary on these shows. Mine is that they are wonderful. His voice is in great shape with the sets showing an smart choice of non-hit songs. Plus, and I am surprised no-one else has mentioned this yet, I think the all-acoustic band arrangements are perfect – simple, clear, strong and full of energy: just listen to Jack-A-Roe and compare it to the released version, the same with the driving version of I Want You (although I do also love the slow versions on the MTV outtakes) – these guys are really cooking. I’ve got good quality audio versions of all these tracks, and I listen to them often, but I would hope that the digital video software available now could extract a lot more detail from the underexposed footage than would have been possible twenty years ago so I would vote for these being a top choice for an upcoming Bootleg Series release with a DVD/Blu-ray option. Thanks for your comment David F.
I agree, the band is cooking! Thanks for posting these videos! This is the first I’ve ever seen any leaked out, except for the CD-ROM excerpts. To my mind, these shows are special due to the diverse, unusual setlists that include both seldom-performed originals and choice traditional covers as well as the strikingly inspired if very uneven vocal performances. I do think they are a tad overrated but I love them nonetheless. You can find timeless shining performance jewels interspersed with some frankly painfully pinched, even embarrassing nasal catastrophes, even with the same songs. A well-curated presentation of these sessions featuring, say “Ring Them Bells,” “Queen Jane,” “One Too Many Mornings,” “Delia,” “Tight Connection,” “Jack a Roe,” “Weeping Willow,” a few more–though, yes, even these have a few dodgy moments, but overall pack a whallop. You can hear the flame of inspiration in his voice. This comment is EXACTLY my opinion. Those particular tracks: Queen Jane, Ring Them Bells, Tight Connection, Delia, Jim Jones, Jack a Roe, One Too Many Mornings, a few others–are outstanding, all-time classics. But the show is also filled with disastrous vocal debacles. Wild, wheezing, pinched Helium Bob at his worst. The best of shows, the worst of shows. Any Bootleg Series that isn’t judiciously chosen would be embarrassing. But a well-curated set would be a treasure. Although I had heard recordings of these excellent shows, I had never seen any of these clips before now. Thank you for posting them here! love these shows AND I love the Unplugged show (and rehearsals that you posted recently). I was at one of these shows. Can’t figure out which one. He opened with Queen Jane Approximately as I remember. I was so close I could’ve hit him with a paper airplane. Very magical. When he played Like a Rolling Stone the entire room was lifted high up into the astral plane. The most amazing thing he can smile showing all his teeth while simultaneously playing the harmonica. I don’t think he’s still mortal human being. Hi Philip & thanks for your comment. The Best of the Supper Club should be the next volume of the Bootleg series. To My Mind there are only 4/5 volumes left. The second defense of Late era Dylan ( Tell Tale Signs being the first) The Supper Club. The last Magnum opus of early acoustic Dylan (folk singer’s choice/ Minnesota Hotel Tape, and anything else left in the kitchen sink), The complete Basement Tapes, and The Magnum Opus of the old man’s Never Ending Tour in two earth shaking installments. Thanks for putting this up. I was living in Westchester County, NY, at the time, and made it to the late show the first night. I remember these shows being announced on very short notice. The tickets were being given away for free. No one knew why, and I have never heard any explanation other than that the shows were basically a gift from Bob to his fans. Anyway, I recall being on line at Tower Records in the Village around 7:00 A.M. to get tickets for a friend and myself. The night of the show, I took my six-year old son to a Soccer awards gig in Chappaqua, and then hopped the train down to Grand Central and walked to the Supper Club in the theater district. What a show!! It was a very small, intimate venue. Dylan and his band were in first rate form, and it sounded especially great after a couple of weak early 90’s NET stints that had followed G.E. Smith’s departure from the band. I’ll never forget that amazing rendition of “Queen Jane.” Each time it seemed that Dylan was going to reach for a high, extended note (like on “remain” and “explained” and “Jane”), the crowd would get louder in anticipation — was he really going to try to hit that note? would he hit it? — and then, when he pulled it off, a mighty roar! They were filming the show, and I have always wondered what happened to the film. I’ve not seen much written about it. 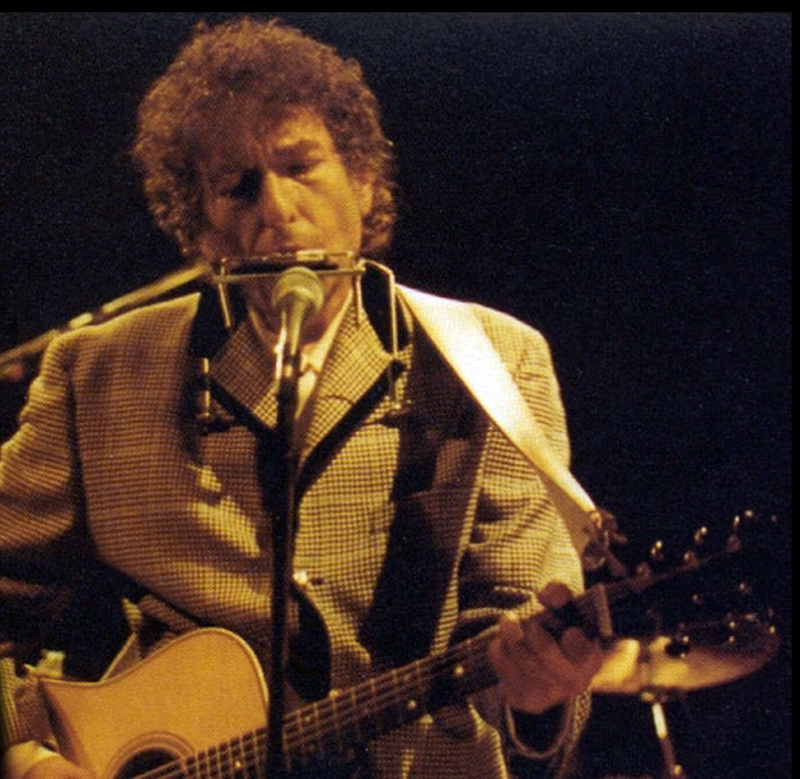 Three has been some mention that Bob and Sony may put it out as part of the Bootleg Series. Sure hope they do. I’ve seen Bob in concert about 54 times since 1974. This was definitely in the top 10, maybe the top 5. I believe that the shows were free because they were being played specifically to be filmed. It has been thought that the film never appeared due to the poor lighting, which you can see here, but maybe it was just one more example of Dylan’s tendency to hide his best work, either out of cluelessness, perversity, or some combination of the two. You are definitely right, these shows would make an excellent addition to the Bootleg Series. You were lucky to be there! some good performances in these shows. tight connection, jim jones, delia, weeping willow are standout songs for me. Twenty years already? Time enough to season well. Most delightful. i dont agree!! the supper club performances are way overrated !! Dylans voice here will not be winning over any disbelievers on the merits of his singing abilities in fact i much prefer the UNPLUGGED sessions a year later where i feel he uses whats left of his vocal chords far more effectively.Hearing him here struggling on songs like LAY LADY LAY (featured on bootlegs of the complete supper club performances) is a sad reminder on how well he once could perform and the fact that there has been a steady decline in his singing since the 1981 tour. Nobody’s insane. Most opinions are valid here. Darkeyez: calm down before commenting next time around… or the comment will not be approved. Should say for Bob, vocal guitar and harp, and add banjo for John Jackson.